Entrepreneurial women, industry leaders and business owners honored by National Association of Women Business Owners. 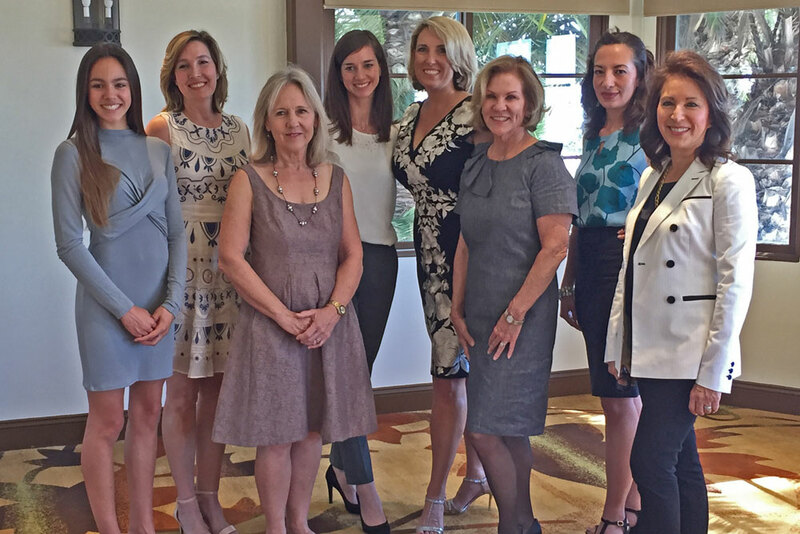 Eight local women who have enriched the Santa Barbara economy, politically, philanthropically and socially were recognized Thursday by the Santa Barbara Chapter of the National Association of Women Business Owners. NAWBO-SB held its third annual BRAVO Awards honoring entrepreneurial women, industry leaders and business owners at the Hyatt Santa Barbara. Among those honored were Anne Pazier of Santa Barbara Gift Baskets as Woman Business Owner of the Year; Marine Schumann, co-founder and general manager of Brighten Solar as Entrepreneur to Watch; and Renee Grubb, co-founder of Village Properties, as Philanthropic Champion. “It is an incredible honor to be recognized by these women that I admire in the community,” Pazier said. Pazier added that about 95 percent of the local Santa Barbara products carried at her Old Town Goleta storefront are owned and operated by women. Kristen Miller, president and CEO of the Goleta Valley Chamber of Commerce, was named Public Policy Leader of the Year; Kris White, retired director of Computers for Families, waschosen as Education Advocate of the Year; Cam Gittler, president and license partner of Engel & Volkers, received a Lifetime Achievement Award; and Anna Lopez-Carr, co-founder of Le Sorelle, was selected as Member of the Year. Lyla Krock, a San Marcos High School student, was recognized with the Rising Star Award for her work with raising money through Cards for Cats to donate funds to the Animal Shelter Assistance Program. Krock teaches third-graders at Monte Vista Elementary School about the importance of volunteering and getting involved in the community. More than 100 attendees at the luncheon had the opportunity to listen to keynote speaker Nancy O’Reilly. O’Reilly is a licensed psychologist, motivational speaker, women-empowerment expert and international philanthropist. In addition, she is the founder of the Women Connect4Good Foundation, a nonprofit that urges women to support each other to create a better world. Since 1975, NAWBO has become a unified voice of more than 9 million American women-owned businesses representing the fastest-growing segment of the economy, according to the organization. The dues-based professional association represents the interest of all women entrepreneurs across all industries, and includes more than 5,000 members and 60 chapters across the nation. NAWBO-SB members thanked the following corporate partners: Women Connect4Good, Inc. Foundation, Buynak Fauver Archbald & Spray, Montecito Bank & Trust, Santa Barbara Community Bank, Foundation for Santa Barbara City College, Cox Business, WitMark Marketing & Branding Group, Impact Hub Santa Barbara, N&S Expressions, Noozhawk, Dowitcher Designs, Linda Blue Photography, Accountability Plus, Tiffany & Co., Kelsey Crews Photo and Pacific Coast Business Times.